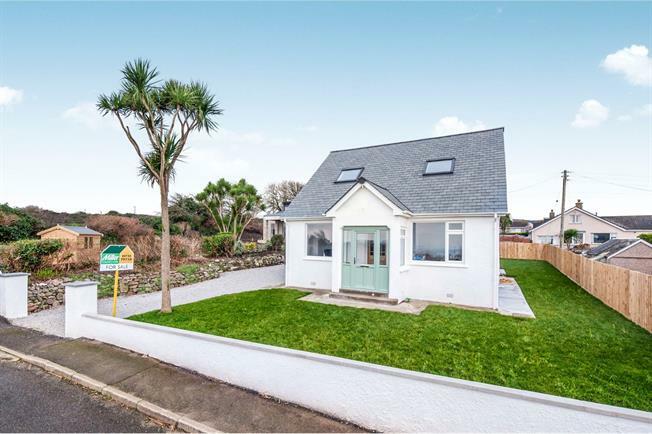 3 Bedroom Detached Bungalow For Sale in St. Ives for Asking Price £450,000. This three bedroom house has recently been completely refurbished and now offers modern and contemporary accommodation which comprises in brief of; A entrance porch leading into hallway, a living room with feature fire place, a large kitchen diner, a utility room, a family bathroom and third bedroom on the ground floor. On the first floor there are two further double bedrooms and a bathroom. Outside the property has generous gardens and parking for several cars. An internal viewing of this property is highly recommended. A partly glazed front door leads into a useful entrance porch with tiled flooring and double glazed windows to the front and side. A further door leads into the entrance hallway. A carpeted hallway, with radiator and access into the living room, dining room, third bedroom and family bathroom. A carpeted living room with feature fire place, a radiator and a double glazed window to the front with distant sea views and a window to the side overlooking the garden. A recently refitted shaker style kitchen, with wooden work surface, tiled flooring and a tiled splash back, a freestanding gas cooker with overhead extractor, a double belfast style sink and a wall mounted boiler. There is a double glazed window to the side overlooking the garden. A useful utility with tiled flooring, a radiator, a double glazed window to the rear overlooking the garden, plumbing for a washing machine and space for a tumble dryer. A partly glazed door leads out into the rear garden. A luxuriously appointed bathroom with vinyl flooring, partly tiled walls, a freestanding bath, a low level W/C, a pedestal wash hand basin, a extractor fan, a heated towel rail and two frosted double glazed windows to the side. A generous double bedroom with carpeted flooring, a radiator and a double glazed window to the front with distant sea views. A carpeted staircase leads to the first floor landing with access into the two bedrooms and family bathroom. There is also a velux window to the rear. A generous double bedroom with carpeted flooring, a radiator, a double glazed window to the side overlooking the garden and two velux windows to the rear. A double bedroom with carpeted flooring, a radiator, a double glazed window to the side with views over the town, a velux window to the front and eaves storage. Outside the property is surrounded by landscaped gardens which are mainly laid to lawn, there is a large patio to the rear perfect for alfresco dining and to the side of the house is a large gravelled driveway with parking for several cars.